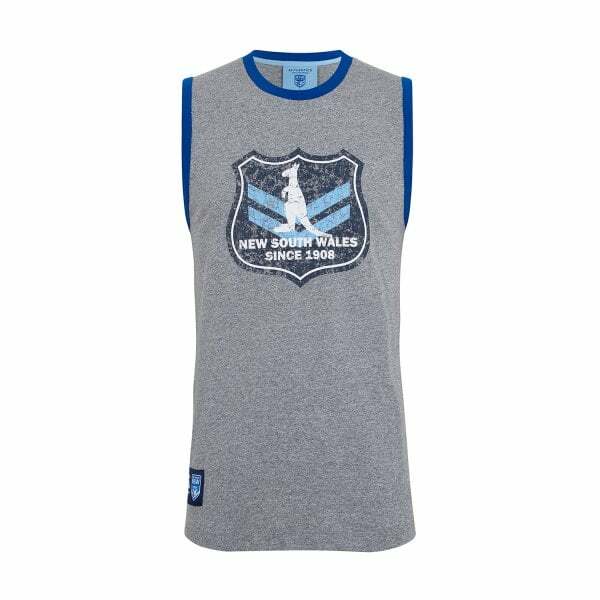 Show off your guns and declare your support for the Blues in this unique tank from our 2019 NSW Supporters collection. Featuring an iconic logo with a kangaroo on the 1908-2008 NSW Centenary Shield, this is a must-have inclusion for your Origin supporters wardrobe. Canterbury’s Vintage Shield Tank really looks the part, whether you’re working out or relaxing in front of the game. It’s made from a soft, breathable cotton and polyester blend and shows off your guns as well as your support for the Blues. This tank is also a unique collectors item because it features a washed back retro style print of a kangaroo on the NSW 1908-2008 Centenary Shield, highlighting the established position the Blues hold in State of Origin today. One for the collection that you can use for everyday training as well and available now in Canterbury’s 2019 NSW Supporters collection.